Dubai, Dec 31 : The International Cricket Council (ICC) Monday announced that former Australia pace bowler Glenn McGrath will be inducted into its Cricket Hall of Fame Jan 4 during the lunch interval of the third Test match between Australia and Sri Lanka in Sydney. McGrath becomes the 68th male member of the Hall of Fame and joins fellow 2012-13 inductees West Indian Brian Lara and England's Enid Bakewell in being recognised by the ICC and the living members of the Hall of Fame. While Lara and Bakewell were inducted in September at the ICC Awards, McGrath will be inducted at his home ground, the Sydney Cricket Ground (SCG). A fourth and final inductee of 2012-13 will be announced next summer. McGrath, who represented Australia in 124 Test matches between 1993 and 2007 claiming 563 Test wickets at an average of 21.64, still has more Test wickets than any other seam bowler currently in the game or retired. 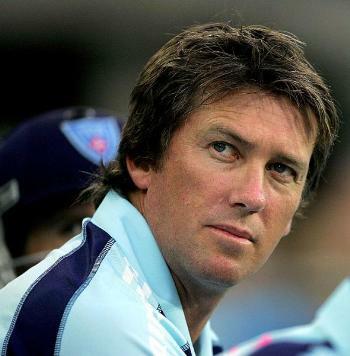 He also represented Australia in 250 One-Day Internationals (ODI), claiming 381 wickets at an average of 22.02 and was part of the Australian side that won three successive World Cups (1999, 2003 and 2007). McGrath still holds the record for most wickets in World Cups with 71 scalps and his figures of 7-15 against Namibia are the best in the competition's history. McGrath said of the induction: "I am honoured that the ICC Cricket Hall of Fame voting academy, which includes all the current living Hall of Famers, have nominated and voted me to be inducted into the Hall of Fame.